This year really will be your Presentation Day! The club has decided not to put on any events this year on Presentation Day. Not because we are mean spirited BUT simply to continue the good work we have started in terms of engaging parents, managers and coaches in understanding that Bingham Town FC really is your club and you are a massive part of it! 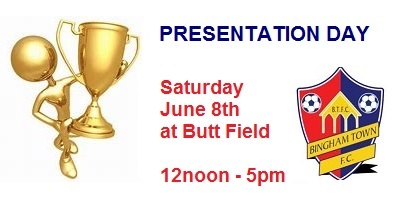 The club will, of course, be providing the staging, PA system, trophies and the kitchen will be open as usual (and probably an ice cream van - although an enterprising squad might want to organise this themselves!) but then the rest is up to you - the squads and parents! An email has gone out to everyone explaining everything and asking you to 'Get Involved.' We would like you to provide some interesting/challenging entertainment for the players and guests on the day. - Contact the club to advise what you are doing to secure the idea and ensure that nobody else can have it - first come, first served. ALL PROCEEDS FROM YOUR EVENT WILL GO TO YOUR SQUAD FUNDS FOR THOSE LITTLE EXTRAS eg A TEAM DAY OUT, RAIN JACKETS, BOBBLE HATS, WATER BOTTLES - SO IT IS UP TO YOU TO MAXIMISE YOUR OPPORTUNITY! THERE WILL BE AROUND 500 PARENTS/GRANDPARENTS DURING THE DAY PLUS THE PLAYERS LOOKING TO SPEND THEIR MONEY ON SOMETHING SO MAKE IT GOOD! - Ideas you might want to consider - stocks (if you have some or know where to get some from) with soak the manager; welly wanging; Cake/Bake off stall; Foot volleyball; Football into a bucket; Hire a bouncy castle (your responsibility not the football club); Three legged race - anything! It doesn't have to cost a lot - just something to keep players of all ages entertained. It is amazing how quickly a 50p/£1 charge can mount up especially if you've got a good idea which gets people interested and want to try again. So, get those thinking caps on! I look forward to receiving some great ideas. BINGHAM TOWN FC adults and vets pick a Winner!  Race Night - a fantastic success!